According to the Oral Cancer Foundation, in 2018 an estimated 51,550 new cases of oral cancers will be diagnosed in the United States. It is imperative to schedule regular oral cancer examinations with your periodontist to catch any suspicious changes and ensure early detection at a stage where cancer is easier to treat. An oral cancer screening is a completely painless procedure, performed by Dr. Aalam and Dr. Krivitsky at the CENTER for Advanced Periodontal & Implant Therapy. During the visual examination, your experienced Brentwood periodontists will check for abnormalities by evaluating the oral cavity and surrounding areas and tissues for unusual bumps. Malignant types of cancer can spread to other places in the oral and maxillofacial regions, posing additional secondary threats. During bi-annual check-ups, your periodontist should thoroughly check for changes and lesions within your oral cavity. This dedicated and comprehensive oral cancer screening should be performed at least once each year with an experienced dental care provider like Los Angeles periodontists, Dr. Aalam and Dr. Krivitsky. If any suspicious lesions are discovered during the routine oral cancer exam, a biopsy will be performed. For the biopsy, a small piece of the lesion is removed and then sent to a laboratory for microscopic analysis. Once the biopsy report comes back, our periodontal surgery specialists will develop a specific treatment plan for the patient based on the findings. It is important to note that around 75% of oral cancers are linked to modifiable behaviors such as tobacco use and excessive alcohol consumption. Other factors include poor oral hygiene, poor nutrition, and some chronic infections caused by bacteria or viruses. If the disease is diagnosed in its earliest stages, treatment is generally very effective. Learn more about oral cancer treatments and prevention from The Oral Cancer Foundation. Red patches on the floor of the mouth, the front and sides of the tongue, white or pink patches which fail to heal, and slow-healing sores that bleed easily can be indicative of pathologic (cancerous) changes. 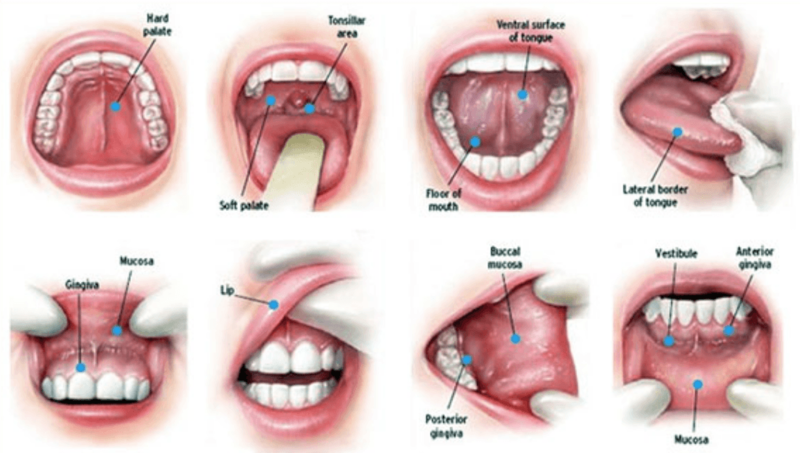 Lumps or the general thickening of tissue anywhere in the throat or mouth can signal pathological problems. Not all lesions are cancerous. The lesion may be a cyst, irritated tissue, overgrowth of tissue or the result of trauma. A biopsy will determine whether the lesion is a sign of oral cancer or not.